Where do i begin – WOW – there was a lot that i definitely didn’t see coming even though a majority was quite expected. We are picking right up where we left off, June is the Princeps Elect (or one of 3) that’s to shadow Anden who is the new elector of the Republic. The princeps will become the leader of the senate so it’s a BIG DEAL. Day is still the people’s favorite given that he’s what they want – a rebel that will fight for them….and Anden will do what he can to make Day stay on his side. Where this story opens up though is several months after we last left these guys, and the colonies and the Republic are at it again. The colonies are planning to attack again, and the only way that Anden thinks that he can keep them at bay (especially now since the colonies have an ally in Africa who apparently is a super power) – is to turn over Eden, Day’s brother in the search for a cure of the plague since it’s spread into the colonies. Anden decides that he has to use June to get Day to respond to requests and she reaches out to him to come back to Denver the capital in the hopes of convincing him (which she knows is a lost cause). While everyone’s together though, the colonies decide that they are going to strike anyway – without waiting for a deal to be made. This means that chaos ensues. people are at risk, we know that the colonies want to capture Day and Eden, and they want to kill Anden, June and the other princeps elect. Day has to work with the patriots to keep everyone safe, while evacuating the city. We get to see Thomas and Commander Jameson stand trial and get their sentence doled out, but while we’ve always held out hope that Thomas isn’t as bad as his actions, we know that commander Jameson truly is, and she doesn’t disappoint. we learn that she’s working for the other side and that causes issues of it’s own. Throughout the story, we see the constant battle of trying to get to Eden to use his blood for a cure, we see the constant fight that Day has with his health since we know that his brain is infected – we see the relationship develop at times between June and Day but it’s never fully taken to where it needs to go overtly at least. 1) they bring into play Antarctica – i don’t know about you guys but i NEVER would have expected that bit of things. what they’ve done there and the power that they’ve become – i mean WOW! 2) at this point you don’t even know what’s going to happen to the republic or Colonies or anyone – and that’s kind of nice. so, while i think that i may have expected a different ending, i’m pleased with it. I liked that it wasn’t clean and cut and dry – but i was a little sad which i know was the intention. I’ll continue to compare to Requiem and Allegiant at this point. Requiem left us high and dry – and Allegiant definitely didn’t give me what i was hoping for. In this story though, I did get what i was hoping for, just not in the same path and form that I expected. All in all though, great closure and a great resolution to the story. 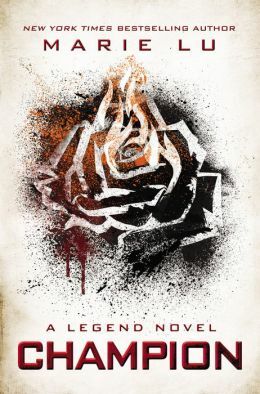 This entry was posted in Dystopian, Reviews and tagged Champion, Dystopian, Legend Trilogy, Marie Lu by iscm13. Bookmark the permalink. Loved your review! And Champion was fantastic, we need to introduce the Legend trilogy to more readers; it is ridiculously underrated.